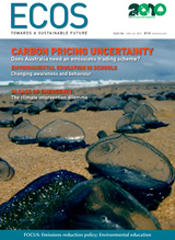 Can we reduce emissions without an emissions trading scheme? The business sector wants stability and certainty to guide investment, but is an ETS the answer? Australia is a world leader in environmental education but recent changes to how it is taught pose some problems say experts. Climate intervention technologies are firmly on the mainstream research agenda as potential strategies for a climate emergency. A pilot program sows the seeds of a sustainable teak plantation industry in Northern Laos. Much has been achieved over the last two decades to improve the environmental performance of buildings and infrastructure, but it is still early days in our understanding of how we can shape more sustainable communities within the built environment. Recent progress in nature restoration in Japan by Jiro Kikkawa. In 2007, the Noosa region on Queensland's Sunshine Coast was designated a UNESCO biosphere reserve. What is the biosphere concept and why does Noosa fit the bill?